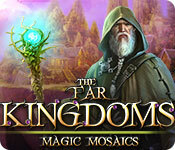 The Far Kingdoms: Magic Mosaics is rated 4.0 out of 5 by 27. Rated 5 out of 5 by J4016C from Wonderful game Love mosaic games and this one is a keeper. I cannot say anything negative. I em enjoying this game and is a great way to relax. Rated 5 out of 5 by DRAGONWYN from Love as muh as FanasyMosaics!!! Just as enjoyable as the Penguins adventures, especially since I couldn't download #14 due to a freeze up flaw BF couldn't fix. The other new mosaic game with the different colors and shapes is too messed and annoying for the sake of more challenging. I can't even remember It's name. This is vey like the Fantasy mosaics but with a fresh story and fantasy theme world to rebuild. Love it. I have a free token with Fantasy Kingdoms name on it. Rated 5 out of 5 by kdeltakilo from A New Favorite I love everything about this game: The scenery, the music, the puzzles, the storyline. The puzzle images are easy to make out and make sense for their environment. The colors are fun to work with and change from puzzle to puzzle. The backgrounds are not static, and the worlds they create are mesmerizing. The story is entertaining. They know how to do mosaics. It's hard to pick which world I liked best because I liked them all. I appreciated that the fish in the undersea world were not overly cartoonish. They looked like real fish. But I also like the flowing lava in the fire element world and the flowing crystal waterfall at the end. I didn't think anything would ever beat the Fantasy Mosaic games in this category, but this did it. Even though the puzzles are on the easy side, this is now my favorite mosaic game of all time. Rated 5 out of 5 by woofess from At Last!! Another logical game! I have been waiting so long for another game of the same quality as World Mozaics Chroma! Puzzles which are well-constructed that rely on logic to solve them. Puzzles which rely on having to guess or use clues to solve are poorly constructed in my book and very frustrating. Well done, developers and please keep them coming!I I recommend this game. Rated 5 out of 5 by alowan from A great break from doing my taxes! The Far Kingdoms: Magic Mosaics, which I finished a few minutes ago. An enjoyable game; and a nice break from working on our taxes! The puzzles aren’t all that hard. IIRC the biggest are 20 x 15, or maybe 20x20. What I really love about the game are the graphics. I haven’t seen such good background work since the first 4 Elements. They change twice or three times within one level, and are different for each level, too. Biscuitsmama is right; they change for each new character. It actually has a plot! A very simple one, but there are 5 characters that actually talk to you! (I don’t know if there are voiceovers; I was listening to the radio.) Another nice thing is that, after you finish the puzzle, they actually tell you what the pictures are meant to represent! When I looked and said, “What the heck is that,” I could find out by looking above the score window. There are only 4 levels, which is, I suppose, why the puzzles are so easy. I thought about withholding a star for that, but flipped a coin and didn’t. I want to encourage these devs to make more mosaics!! Rated 5 out of 5 by grandmacathy from Outstanding!!! Before I say anything else about this game, you need to know that I LOVE these mosaic puzzle games. I love the way you need to think about where the colored blocks could be hidden, and trying to figure out what the picture could be. I try every game like this when I find it at Big Fish. I enjoy some more than others. Saying that, you would think it would be hard to impress me. This game, however, outshines other similar games. It has fantastic backgrounds; the emerging pictures are keyed to the background (like the seahorse in the underwater background). The music is soothing, and I even keep it on. (Many games have irritating music) With the coins you win by finishing a puzzle, you upgrade your kingdom. Other games have you decorate your 'home', but not with the superior graphics that are in this game. I almost didn't want to stop playing so I could write this review! I bought this right away. Rated 5 out of 5 by JessF from This wins 2nd place.. after Mr Penguin of course Very nice. Not too difficult, not too easy. Nice clear pictures - and I like the way the unused grid squares evaporate, leaving you with just the image. I was happy to see such a variety of colors.. my only complaint is that some of them were hard to tell apart. The blues for example, when the slightly darker blue was highlighted it was almost exactly the same color as the light blue. If you like these games, try it out. 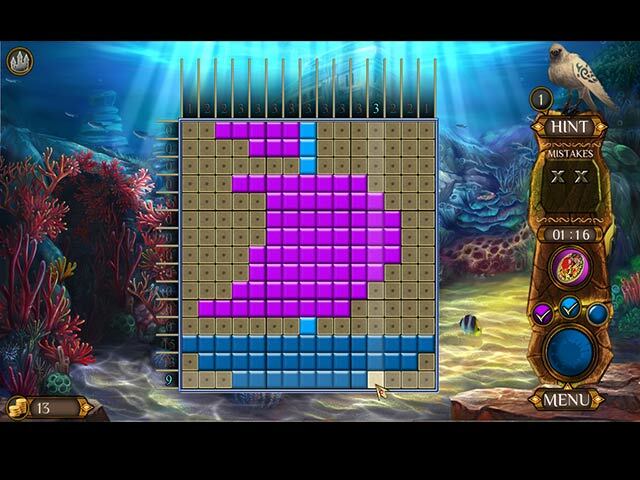 Rated 5 out of 5 by pennmom36 from A BEAUTIFUL AND RELAXING MOSAIC GRIDDLER It seems everyone's catching on to the three color mosaic games, just when Mr. Penguin finds a fourth color! 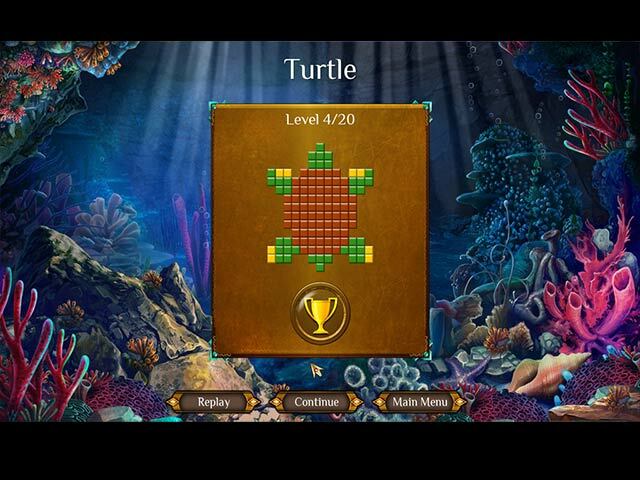 This is a very relaxing griddler game, the music is very soothing, the colors are beautiful, and each puzzle makes an obvious picture when completed such as a Sailboat, a Blowfish or a Sea Turtle. 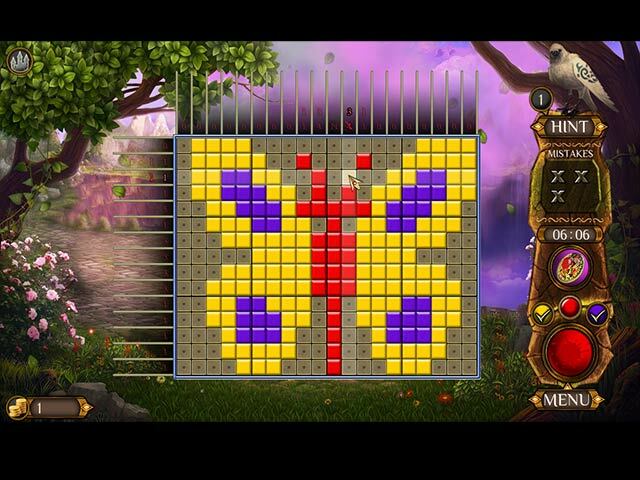 The object of this game is the same as other mosaics or griddler games, fill in the cells with the correct numbers as shown on both the columns and rows. Each group of numbers must be separated by at least one empty cell. Sometimes it's easier to figure out which cells can't possible be filled in, to reduce the possible filled cells. Some cells contain extra hints, some contain coins that can be used to upgrade your royal Kingdom, which can be accessed at anytime by clicking on the castle icon located on the top left of the screen. If you get stuck, you can switch to another color, use an available hint, or, once the Amulet has been fully charged, you can get a mega hint which fills in four random cells for you! I love the colorful graphics, especially the puzzles that are in the sea, it's kind of like a live wallpaper where all the sea creatures swim around. There are 4 different Kingdoms you will solve puzzles in that represent the four elements, Water, Air, Fire and Earth. I'm really impressed with this mosaic game, I love the themes and the puzzles aren't too hard or too easy, so give it a try, enjoy! Refill four magic runes and help the poor wizard return back home.